Kelmscott House was the London home of William Morris from April 1879 to his death in October 1896. Originally called “The Retreat”, it was here that Sir Francis Ronalds set up a primitive telegraph in 1816. He ran eight miles of cable encased in glass tubing throughout the back garden and succeeded in getting an electrical signal along the full length. He contacted the Admiralty, but they were not interested at that time in telegraph. 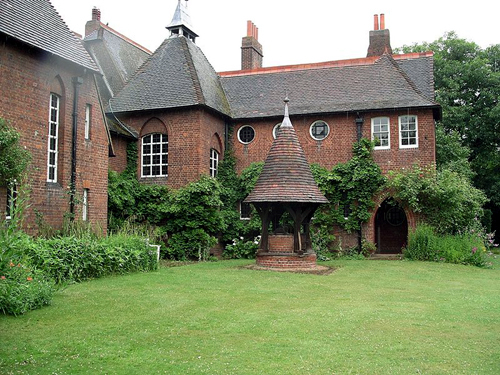 The building is a private house, though the basement and coach house entrance serve as headquarters of the William Morris Society, and are operated as the Kelmscott House Museum. The museum is open on Thursday and Saturday afternoons. 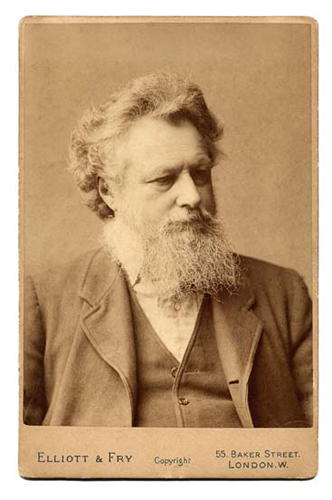 Born in 1834, William Morris was a writer, poet, painter, designer, printer, craftsman and social reformer. It was at Exeter College, Oxford, that the undergraduate William Morris met Edward Burne-Jones, who became his life-long friend and collaborator. Both had gone to the University with the intention of entering the church, but gradually decided that their energies were best spent on social reform. Morris also joined a group known as the “Brotherhood”. Together, they read theology, ecclesiastical history, and medieval poetry; studied art, and during the long vacations visited English churches and the Continental cathedrals. They became strongly influenced by the paintings of the Pre-Raphaelites, by the writings of John Ruskin and the poetry of Alfred, Lord Tennyson. Ruskin admired the crafts of the Middle Ages and saw the decorative arts as a vehicle for enlightenment and social change. He felt that hand-craftsmanship was the basis for joyful work through which artisans could be raised to the status of artists, creating works that would be affordable with no hierarchy of artistic mediums. Morris decided to become an architect and at the beginning of 1856 began work at the office of George Edmund Street, one of the leading English Gothic revival architects. Here he formed a lifelong friendship with the senior clerk, Philip Webb with whom he studied architectural drawing. Webb was to build the famous Red House for Morris and his wife and had an important influence over the development taken by English domestic architecture during the next generation. In London, Morris was absorbed into Pre-Raphaelite circles. Dante Gabriel Rossetti, one of the founders of the Pre-Raphaelite brothers and already established as a painter and a poet, persuaded him that he too ought to be a painter, although he appears to have only completed one oil painting. At the end of 1856 Morris left Street’s office. It was soon after this that Morris and most of his Pre-Raphaelite colleagues joined The Artists Rifles. This was established in 1860 as the 38th Middlesex (Artists) Rifle Volunteer Corps and was part of the widespread volunteer movement which developed in the face of potential French invasion. Its first commanders were the painters Henry Wyndham Phillips and Frederic Leighton. The unit’s badge, designed by J.W. Wyon, shows the heads of the Roman gods Mars and Minerva in profile. With Morris early members of the Regiment included Ford Madox Brown, Burne-Jones, William Holman Hunt, John Millais, Val Prinsep, Dante Gabriel Rossetti, Simeon Solomon, John Roddam Spencer Stanhope, and Algernon Swinburne. Members were largely fellow painters, sculptors, and engravers, but also included musicians, architects and actors. 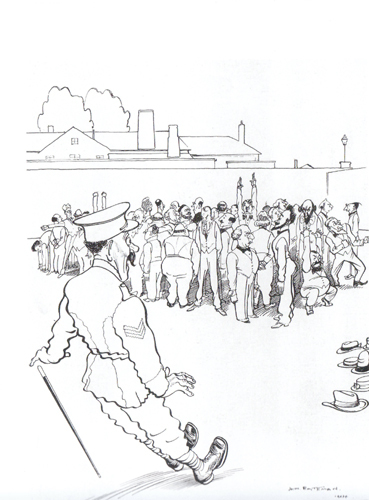 An early account of their volunteer experience includes such examples as Holman Hunt forever losing parts of his disassembled rifle; Morris confusing his right from his left during close order drill, invariably begging pardon of the comrade whom he found himself facing; Rossetti having to question and quarrel over the reason for every command, and Madox Brown shooting his own dog ‘the first time he was set to target practice’. In 1861, with three of his fellow Volunteers – Rossetti, Burne-Jones and Madox Brown together with Webb, P.P. Marshall and Charles Faulkner, Morris founded the decorating firm originally called Morris, Marshall, Faulkner & Co. “Fine Art Workmen in Painting, Carving, Furniture and the Metals”. Known as “The Firm” it was to profoundly influence the decoration of churches and houses into the early 20th century. 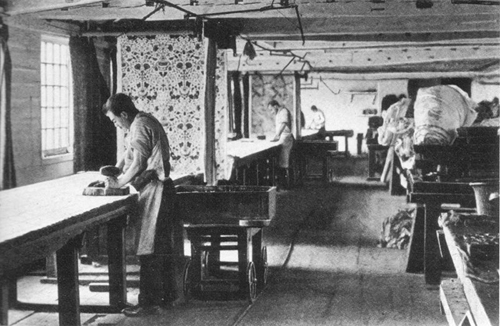 Morris’s chief contribution to the arts was as a designer of repeating patterns for wallpapers and textiles, many based on a close observation of nature. He was also a major contributor to the resurgence of traditional textile arts and methods of production. In March 1875, after much acrimony, the Firm was reconstituted under William Morris’s sole ownership. 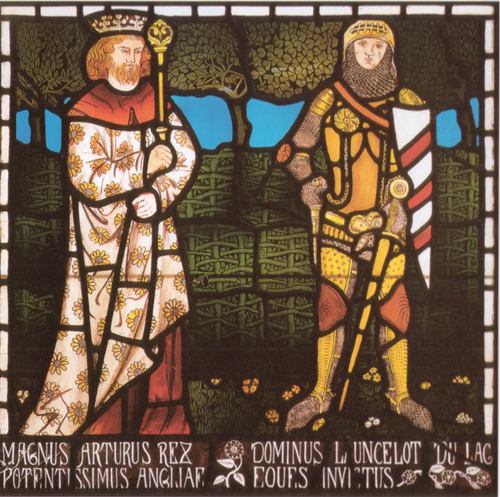 From this time the company was officially Morris & Co..
King Arthur and Sir Lancelot, one of a set of 13 stained glass panels commissioned from Morris, Marshall, Faulkner & Co.. This is one of four panels designed by Morris. In 1871, having given up the Red House, in Bexleyheath, some years before, Morris signed a joint lease with Rossetti on Kelmscott Manor, in Gloucestershire. He regarded the house as a work of true craftsmanship, totally unspoilt and unaltered, and in harmony with the village and the surrounding countryside. However his main family home was still in London. 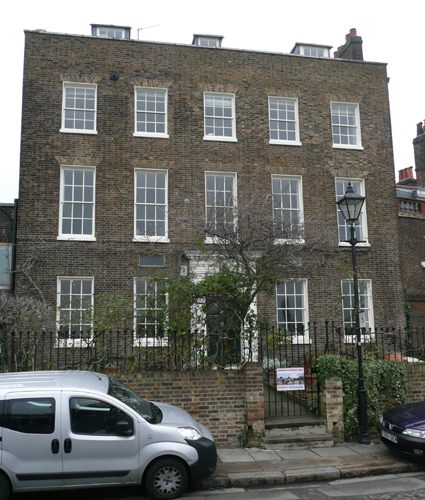 From 1872 to 1882 the Morrises lived at Horrington House, Turnham Green, then moved to Kelmscott House, in Hammersmith. Throughout this time Morris continued with his writing, producing several volumes of poetry and many prose romances, as well as the four-volume epic Sigurd the Volsung, which came out in 1876. In 1877 he founded the Society for the Protection of Ancient Buildings (SPAB), one of the earliest conservation societies, to oppose what he saw as the insensitive renovation of ancient buildings. He also gave the first of many hundreds of lectures in which he related the aesthetic standards in any given country to its prevailing social conditions. The first collection of these lectures was published in 1882 as Hopes and Fears for Art. Morris defined art as ‘man’s expression of his joy in labour’. He believed that it was an essential part of human well-being. He sought to produce fine art objects for the masses, but it was only the rich who could afford his expensive handmade products. 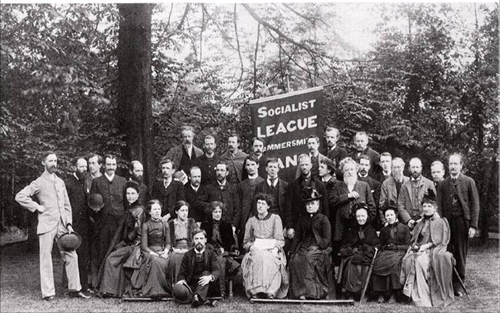 A utopian socialist who did much to develop British socialism, in 1884 he formed the Socialist League. In February 1885 the new party established its official journal, a newspaper called Commonweal with William Morris as the editor. His book News from Nowhere, in which he depicted a future, socialist society in which work would be considered pleasurable and an outlet for creativity was first published in serial form in the Commonweal in 1890. In 1891 Morris became president of the Arts and Crafts Exhibition Society and in 1892 master of the Art-Workers’ Guild. Although acutely aware of the threat to society inherent in mechanization, he was by no means opposed to industry as such, seeing the potential of technical advances for freeing the operative from repetitive and deadening hand processes. He was involved in the first moves towards industrial design, attending the first conferences of the National Association for the Advancement of Art and its Application to Industry in Liverpool in 1888 and in Edinburgh in 1889. In 1891 he founded the Kelmscott Press, ‘to produce books which it would be a pleasure to look upon as pieces of printing and arrangement of type’. 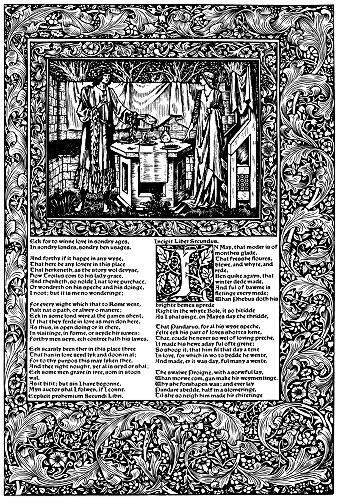 Over the next seven years it produced 53 titles in 66 volumes; its Works of Geoffrey Chaucer, with engravings from Burne-Jones and a binding by Douglas Cockerell, was completed just before Morris’s death. William Morris died at Kelmscott House in Hammersmith on 3rd October 1896. Three days later his body was transported by train from Paddington to Lechlade. The coffin was then transferred into a traditional farmers’ wagon, painted yellow and red and festooned with vine leaves, for the final few miles’ journey to Kelmscott church, where Morris was buried on a stormy day. Philip Webb later designed his tomb. I was contacted by the Kelmscott House Museum in connection with the decoration of the basement that it occupies. As I had served in The Artists Rifles, Morris’s old Regiment, I was delighted to offer what assistance I could. Barry Gregory. 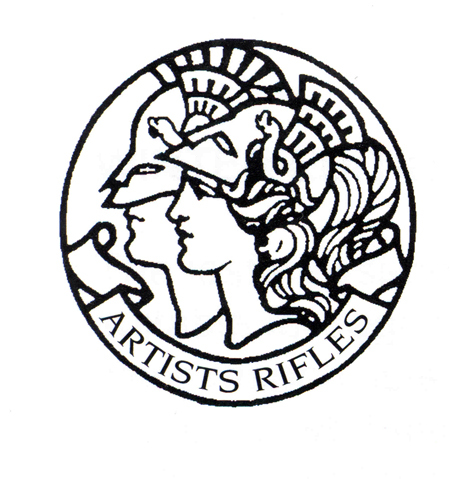 A History of The Artists Rifles 1859-1947. David Latham (ed.) Haunted Texts. Studies in Pre-Raphaelitism in honour of William Evan Fredeman. Peter & Linda Murray. A Dictionary of Art & Artists. David Raizman. History of modern design: graphics and products since the Industrial Revolution.